The body of all living organisms (bacteria, blue green algae, plants and animals) except viruses has cellular organization and may contain one or many cells. The organisms with only one cell in their body are called unicellular organism (e.g., bacteria, blue green algae, some algae, protozoa etc). The organisms having many cells in their body are called multicellular organisms (plants and animals). The terms prokaryotic and eukaryotic were suggested by Hans Ris in the 1960’s. The prokaryotes consists of the bacteria and blue green algae and were first to arise in biological evolution (i.e., about 3 x 10 9 years old). 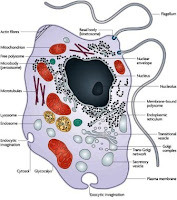 The eukaryotic cells are found in all multicellular animals, plants and fungi. Eukaryotes have arisen probably a billion year after the prokaryotes and much larger and complex. They show a wide range of diversity and differentiation. These are cells are found in all, animals and plants, except blue green algae and bacteria. Absent. Nucleiod region is present where genetic material resides. Each cell has only one chromosome. Number of chromosomes per cell depends upon the type of organism. The chromosome is circular ring lacking a centromere. Each chromosome is linear having a centromere with two kinetochores meant for attachment to the spindle fibres during cell division. Linear double stranded DNA: genes frequently interrupted by intron sequences, especially in higher eukaryotes (called as split genes). Mesosomes perform the function of golgibodies and mitochondria, and also help in the separation of chromosomes during cell division. Only 70S type of ribosomes are present which lie free in cytoplasm, or are engaged in protein synthesis. All aerobic, but some facultative anaerobes by secondary modifications. All share cytochrome electron transport chains, Krebs cycle oxidation, Embden-Meyerhof glucose metabolism or glycolysis. Rare: If present one way (and usually forming partial diploids or merozygotes); transfer of DNA from donor to recipient cell occurs (conjugation). Gene transfer takes place by transformation and transduction also. Both sexes involved in sexual participation and entire genomes transferred; alternation of haploid and diploid generations is also evident. Transcription and translation take place in cytoplasm. Transcription occurs in nucleus and translation takes place in cytoplasm. Cell cycle is short, takes 20-60 minutes to complete. Cell cycle is long, takes 12-24 hours to complete.